The minimal facade of The New Museum has been host to some wild installations since it opened in 2007—ranging from a sign reading "HELL, YES!" to a giant long-stemmed rose. Today, workers finished installing the museum's latest outdoor sculpture: A 30-foot-high remote controlled ship by artist Chris Burden. 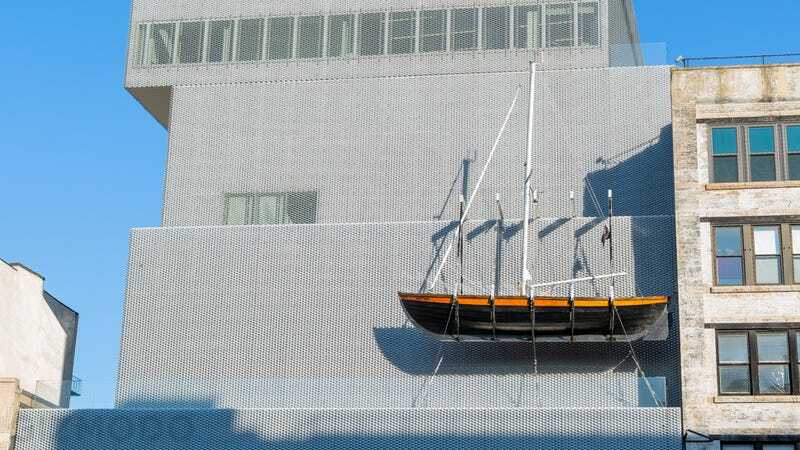 The sculpture—one of many similar ships Burden has designed—was put on display as part of the major fall exhibition, Chris Burden: Extreme Measures. It's not just a model either—it's actually controlled by remote, and can sail for up to 400 nautical miles completely unmanned (when it's not hanging off the side of a building, that is).